“True Sound” is the name of a now long-defunct record label that was started in 1992 by Danny Holloway. He worked for NME in the 70’s and was eventually hired by Chris Blackwell at Island Records where he worked closely with Bob Marley, Toots and the Maytals, Jimmy Cliff, and The Heptones. In 1991, Holloway wanted to try his hand at running his own label and so he started True Sound. He was interested in signing artists of different genres. Legend has it he sent his nephew to look for talent in the Long Beach area where he scoured different clubs and parties. Eventually, his nephew returned with some new artists to show his uncle which included Sublime, members of the Western Hemisfear, and other associated acts. Although Holloway wanted to sign artists of different genres, the True Sound Sampler features only hip-hop acts which include Vooodu! of Western Hemisfear, Supernatural Thang, and Unit One Poetry. When Vooodu! agreed to sign to True Sound he also brought along his producer, Bird. 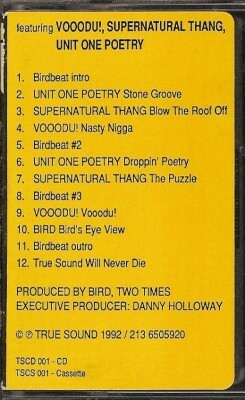 Holloway must have really liked his style because he let him produce the whole compilation. Later on Vooodu! and Bird would form Western Hemisfear along with Rass Kass and Meen Green. The posse cut “Bird’s Eye View” features Vooodu!, Meen Green, and Supherb and has got to be one of the craziest tracks that I have ever listened to. P.S. Cover from cassette edition. comment "VA – True Sound Sampler (Promo CD) (1992) (FLAC + 320 kbps)"